Elate restaurant (111 W. Huron, 312-202-9900) in Chicago’s River North neighborhood, is taking its eco-friendly philosophy to new heights, on Thursdays, by re-inventing itself as the Steampunk center of Chicago. 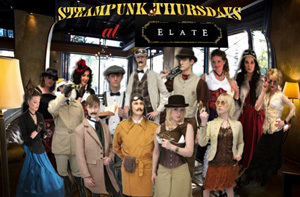 Beginning Thursday, March 22 and on every Thursday thereafter, Elate will be the scene of Steampunk Thursdays. Imagine a world planted in the Victorian era, where steam has become the foremost source of energy and Victorian design and fashion ideas rule. Now imagine that one hundred years later (i.e., today), Victorian sensibility still rules and modern technology has blended with modern rock, techno and jazz music. That’s what Steampunk Thursdays are all about. Beginning Thursday, March 22, from 9:30 p.m. to 12:30 p.m., Elate will welcome local singer/songwriter and rock icon Graham Czach, along with his band the Time Machines. The band will perform sets at 9:30 p.m., 10:30 p.m. and 11:30 p.m. The high energy music, great for dancing or simply listening and enjoying, is the band’s innovative sound where vintage jazz meets modern techno and hip hop. The Steampunk philosophy is about sight as well as sound, so put on your best Steampunk fashions and strut down the aisles of this cool restaurant and bar. If you’re in the know about Steampunk, you’ll love it at Elate on Thursdays. Elate’s acclaimed dinner menu, featuring the culinary artistry of Executive Chef Michael Noll, is available until 10 p.m. and guests can order from the bar menu from 10 p.m. until 11 p.m. Enjoy Elate’s special Steampunk cocktails and carefully elected wines throughout the evening. Elate’s menus offer organic wine, spirits and fare and the restaurant composts, recycles, and purchases as much local product as possible. The interior features reclaimed wood tables and flooring, high efficiency lighting, eco-friendly paint and 80% recycled drywall. Elate encourages the use of hybrid vehicles by offering those cars complimentary valet parking.